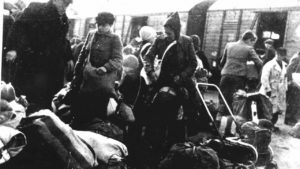 During WW II more than 100 transports of Jews took place from the Netherlands to concentration- and extermination camps in Auschwitz, Sobibor, Bergen-Belsen and Mauthausen. The greater part of these transports took place after 15 july 1942, by train via the Dutch transitcamp Westerbork, with thousands of jewish victims at the same time like sardines in a can on way to their death! (At the end of this article more detailed data are given on this subject). The majority never came back! 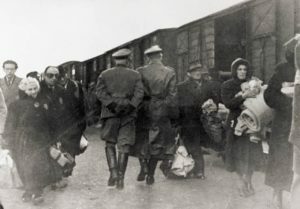 Only in 1942, when Westerbork was equipped for becoming a transit camp (PolizeilichesJudendurchgangslager), the massive transportation of Jews began. Ironically Westerbork was established in 1939 as camp for jewish refugees who fled persecution from nazi-Germany to the Netherlands. In the beginning the transports were for young men, whom were told they would be working in workcamps (so called Arbeitseinsatz). Later on the deportations were meant for women and children as well. 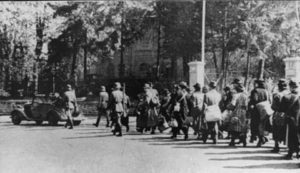 In the end all Jews were set up to transport, including Jews from homes for the elderly, orphanages and other care institutions. 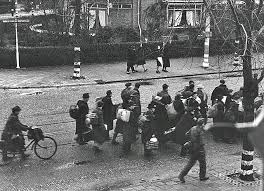 A total of about 107.000 persons of Jewish origin living in the Netherlands were deported. Most of them to Auschwitz and Sobibor and within a very short time mainly most being murdered in gas-chambers. Others died because of heavy penal servitude, severe ill-treatment, medical abuse, malnutrition, illnesses and non treated diseases. Only approximating 5.000 of these Dutch Jews survived the war (Shoah). September the 3rd 1944 Anne Frank was also set on transport to Bergen-Belsen where she met her death. At the end of this article more can be read about Anne Frank. The last transport out of the Netherlands via Westerbork took place on 13 september 1944. 27 febr. 1941 389 Mauthausen Persons by razzia in Amsterdam 22-23 febr. and 'group The Hague', via Buchenwald. 22 mei 1941 342 (3) Mauthausen Persons by razzia in Amsterdam 22-23 februari. 22 juni 1941 277 Mauthausen Persons by razzia in Amsterdam on juni 11. On June 12, 1942, Anne Frank's parents gave her a red checkered diary for her 13th birthday. She wrote her first entry, addressed to an imaginary friend named Kitty, that same day: "I hope I will be able to confide everything to you, as I have never been able to confide in anyone, and I hope you will be a great source of comfort and support." During the two years Anne Frank spent hiding from the Nazis with her family in the Secret Annex in Amsterdam, she wrote extensive daily entries in her diary to pass the time. Some betrayed the depth of despair into which she occasionally sunk during day after day of confinement. "I've reached the point where I hardly care whether I live or die," she wrote on February 3, 1944. "The world will keep on turning without me, and I can't do anything to change events anyway." However, the act of writing allowed Frank to maintain her sanity and her spirits. "When I write, I can shake off all my cares," she wrote on April 5, 1944. The Diary of a Young Girl, as it's typically called in English, has since been published in 67 languages. Countless editions, as well as screen and stage adaptations, of the work have been created around the world. The Diary of a Young Girl remains one of the most moving and widely read firsthand accounts of the Jewish experience during the Holocaust.